A few years back, people were seen getting worried about how to recover data that they deleted mistakenly. Those days stimulated the need for data recovery tools. The current scenario is a complete reversal, people now want to permanently delete data (photos, files, videos etc.) on Android, so that they cannot be recovered in any way. Users now want their data containing sensitive data to be deleted in such a manner that they cannot be recovered by any recovery tool. The requirement came into question due to the extent of data breaches happening across the globe. Hackers, data attackers find every possible way to steal user’s personal and sensitive data. This calls for making something that can save you from data attacks and deletes your personal/sensitive data permanently. File Shredder Apps for Android, what are They? Data eraser apps are those that erase data in such a manner that they get deleted permanently from your Android phones. There may be instances when you share your phone with others or maybe just resell your Android phone. This can pose a serious threat to your personal information if it hasn’t been permanently deleted from your Android device. File shredder apps for Android, permanently deletes data (photos, files, videos etc.) on Android and overwrites the space occupied by it, so that it gets deleted beyond recovery and no recovery tools can recover it. These apps make use of data sanitization methods that overwrite data on internal and external storage of your Android device. In this article, we have listed down some of the best free data eraser apps for Android that are a must-have. Install one of these file shredder apps for Android and don’t let anyone spy on you. An amazing application by PalmTronix. Shreddit is a data eraser app that effectively deletes confidential data from your Android device. It does so by deleting the files/data and overwriting on the space occupied by them. The data is erased in such a manner that no recovery tool can recover it. Shreddit can delete sensitive information stored on both internal and external storage of your Android device. It makes use of advanced data sanitization methods that help to wipe off the data permanently. Some of the advanced algorithms it uses are British HMG IS5 (3 pass), US DoD 5220.22 (3 pass), German VSITR (7 pass), Russian GOST P50739 (2 pass), NIST 800-88 (2 pass), Zero Filler, One Filler (Secure Erase), Random Filler (Pseudo Random Numbers). Download this amazing tool today. An awesome app by Vb2labs. SDelete or Secure Delete is one amazing app that easily erases all the sensitive or confidential information you wish to delete. SDelete wipes the information permanently and makes it impossible for any data recovery tool to recover it. Supports permanent deletion of multiple file type like files, data, folders, images, videos, etc. Easily deletes personal information from internal and external storage. It works seamlessly and is very fast. Different data eraser methods used by SDelete are US DoD 5220.22-M & NIST 800–88. It comes in both variants: Free and Pro. SDelete Pro comes with advanced features like Password lock for app, Priority Support etc. and is available for download from the Play Store at 1.99 USD. Download this amazing tool for free today. In case you want to avail the Pro version purchase it at 1.99 USD. Made by ProtectStar Inc, Secure Eraser is one amazing tool that easily helps you wipe all your personal and sensitive data on a permanent basis from your Android device. It easily shreds your data and recovers valuable storage space from your mobile. With advanced algorithms and data sanitization methods, it makes sure that all the data is deleted is deleted beyond recovery. Secure Erase can delete temporary data & cache, SMS, text messages, photos, gallery, facial recognitions, text messages, WhatsApp, Call logs, clipboard etc. Different data sanitization methods that it uses are DoD 5220.22-M E, US Air Force (AFSSI-5020), BSI-2011-VS, US Army AR380-19, DoD 5220.22-M ECE, BSI/VS-ITR TL-03423, CSEC ITSG-06, NATO Standard, Gutmann, HMG InfoSec No.5, DoD 5220.22 SSD, ProtectStar Advanced Secure Deletion Algorithm (ASDA 2017) and others. 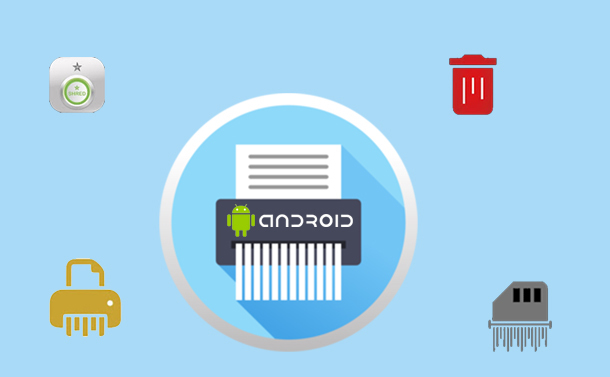 Developed by Apparillos.com, Andro Shredder is one of the most used data eraser apps. Ever thought of what happens to your data when you delete it? Do you think just deleting it wipes it permanently? No, the data remains on your device until and unless the space occupied by it is overwritten by some other data. Andro Shredder is one such free data eraser app that makes sure it deletes the personal data using its advanced data shredder algorithms. Some of the amazing features include scheduling, file preview before deletion, ability to wipe data from writable storage devices etc. The last app in the category of best file shredder apps for Android is FShred. Developed by Emile Gee, this nifty app makes sure that your data is deleted permanently and is safe from prying eyes. FShred has been tested over ample file recovery applications and none of them have been able to recover any of the deleted data. FShred makes it possible by making use of the most advanced data shredder algorithms that overwrite the space occupied by the data. Having sensitive and personal data compromised is the most awful thing that one would never want to happen. It is thus important to always ensure that your phone is powered by the most amazing data/file shredder apps for Android. Seeing the extent of data breaches, it is necessary to permanently delete data (photos, files, videos etc.) on Android devices. Read the complete article to find out which amongst the 5 best data shredder apps for Android suit you best.